We want to update everyone on the next International McGrath Clan Gathering which takes place in the beautiful coastal town of Dungarvan in 2019. The dates will be June 26th to June 30th. There will also be a post event tour, details of which will be release later. It’s vital that we let as many people know as early as possible. If you know of any McGraths who may be interest, please ask them to email info@mcgrathclan.org and well put them on the mailing list or you can forward their email to us. In an effort to let as many of our clan know about the event, we introduced the ‘Journey of the 2019 McGrath Clan Gathering Flag’. It is traveling around the world before returning to Ireland in 2019 ahead of the Clan Gathering. Clan Chieftain, Dan McGrath traveled to Ventura, California in March, for the start of it’s journey at the annual St Patrick’s Day Parade. It was a wonderful occasion as our clan took part in the parade and proudly displayed The Flag. Thanks to Dan Patrick McGrath and Mary McGrath, who organized the event and made our trip to California very memorable. It was great to meet some of our clan who attended the 2016 gathering and made us so welcome. We came home with a first place trophy from the parade which the McGrath Clan won. At this point, I must congratulate the clan members in California who raised $50,000 for charity with a golf outing on St Patrick’s Day. They deserve huge praise for their good work. It continued to the Irish Cultural Centre in Canton, MA, where Mark and Lori (McGrath) O’Connell were the hosts. Eamonn McGrath in the Cultural Centre was a huge help. Next stop was Texas, where it’s host was JJ McGrath, who is The Flag’s co-ordinator for America. It flew high at the Sherman Celtic Festival. The Flag continued to New York, where Tom McGrath, brother of Maurice, Brendan and Kieran, who attended Dungarvan in 2016, was it’s host. He had it on display in The Black Sheep pub, which he owns and is also the title of his book. Currently, it’s in Michigan with Zoe McGrath as it’s host. Next stop is Redondo Beach where Trina McGrath will be looking after The Flag. So far we have had TV, Radio and newspaper coverage of The Flags Journey. Keep up the good work ! There are 25 hosts between the USA and Canada. We do have a couple of free slots, including Christmas and New Year. July to end of September is quiet busy as it travels to cities, towns and festivals in North America. The Clan McGrath, is an Irish Clan. Tradition states the McGraths are of Dalcassian ancestry, stemming from Cormac Cas, King of the Province of Muster in the 3rd century AD. The Irish surname Mac Craith is considered to be patronymic in origin, being a name derived from the first name of the original bearer. The prefix ` Mac’ in Mac Craith, the commonly accepted translation of ` Craith’ is Grace / Prosperity or Divine Grace. Therefore, the literal translation of McGrath is ‘son of divine grace’. As the Irish language was replaced by English, so the spelling of the family name Mac Craith was transformed. The most widely used anglicised spelling of Mac Craith is McGrath. However other variants exist, including McGraw, Macrae, MacCrae, McCreagh, MacGraith, Megrath, MacReagh, MacCraw, McCreath, MacGrae, Makrayth, McKray. These are simply anglicised variations of the same name. This allowed any man whose father, great grandfather eligible for election as King. In the lifetime of the king, one man of the deirbhfhine was nominated heir, to succeed on the king’s death. Brian Boru’s Father Cinnéide had the support of the O’Neill dynasty of Ulster in his rise to power. This link may have drawn the Mac Craith Clan north to Ulster to settle the lands around Lough Derg in Tyrone, Fermanagh and Donegal. 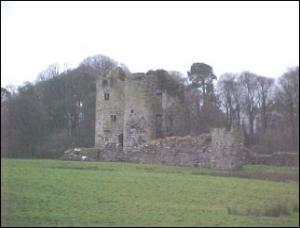 The progenitor of the Clan Mac Craith, was related to the O’Briens of Thomond and served them as poets. The Mac Craith lineage is as follows: Lórcan → Cinnéide → Etchtighern → Flan → Craith. Clan McGrath – The heraldic shield as it appears on Bishop Miler McGrath’s tomb 1622. Medieval heraldry was not an exact science and variations in the design did occur. 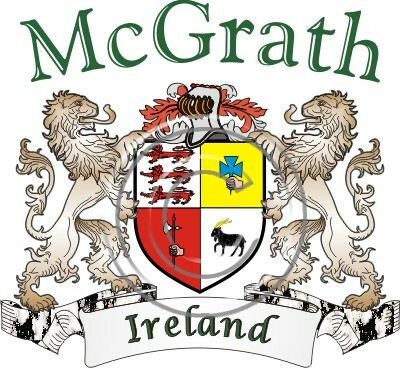 Clan McGrath – Coat of Arms as they appear on Archbishop Miler McGrath’s tomb.